Seattle is a boom town. Until recently, traffic plans during new building construction disregarded the mobility of people walking and biking beside building sites. This disregard is a safety issue, not just an inconvenience. Last year, Seattle created a Construction Hub Coordination Program with dedicated staff who work to improve access for all during construction in high growth areas designated by the City as “Construction Hubs.”. 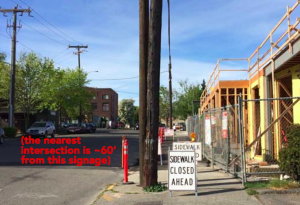 Construction sites in South Lake Union, Ballard, Alaska Way, Capitol Hill, and West Seattle Junction are getting better for people walking and biking near them, but problems still remain, in these locations and throughout the city. What’s the most important acronym on Seattle streets? The Seattle ROWIM or Right Of Way Improvement Manual may be the most important acronym guiding the development of Seattle streets today. How wide are sidewalks required to be? Where can driveways go? What sorts of street lighting do developers need to provide around new condo buildings? These questions are always important, but they are of critical importance now. You might be forgiven for not knowing that more than 10,000 housing units are in the works in Seattle and $2.8 billion worth of projects are under construction, but you have been sleeping if you have missed the 40+ big cranes massively transforming our city in Ballard, U-District, South Lake Union, First Hill, and downtown. Fortuitously, Seattle is also mandated to do a 10-year update of its Right of Way Improvement Manual. 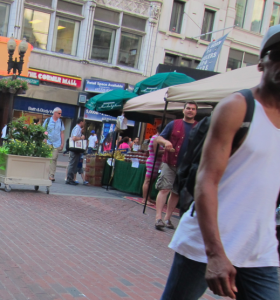 The current ROWIM was written before there was much attention paid to bikes as transportation, parklets, street furnishings, or safe and healthy street architecture for people who walk. Note that SDOT will also be updating its Complete Streets Ordinance as it updates the ROWIM. The City of Seattle hired the Toole Design Group as a consultant on the project and expects to complete the ROWIM update as a web-based on-line document by the end of 2015. Expect the new and improved Seattle ROWIM to have some of the same flavor of Boston Complete Streets Guidelines that Toole worked on last year. We hope to see lots of new street typology — greenways, historic boulevards, festival streets, play streets, home zones and maybe even the elusive woonerf. A group of Seattle people who are passionate about the wonky aspects of streets began meeting in December of 2013 to discuss the ROWIM. The group represented people in Seattle who serve on City Boards & Commissions, people who staff active transportation advocacy groups, students, and interested community members. They met because they all believe the ROWIM has the potential to reflect the aspirations of a Vision Zero, carbon neutral, equitable, healthy city that prioritizes people who walk, bike and use transit. The ROWIM community comments are summarized in a 9-page document, with highlights below. Some comments are about policy, some are really digging into the weeds. We hope you find them all helpful. Read the complete community comments here. Mode hierarchy. Choices about mode hierarchy will happen from now on with every project. SDOT has uncompromising standards for level of service and safety for the movement of motorized vehicles. We need to invest in equally rigorous standards for all modes and a have clear expectations for level of service for all modes of travel. Our recommendation is to place the comfort and safety of people walking and biking at the top of our mode hierarchy. Build to Vision Zero standards. Safe streets are SDOT’s number one concern. The ROWIM needs to include information on traffic control devices, traffic calming on arterials, and traffic calming on residential streets. In order to reach Vision Zero by 2030, every project — especially every major capital project — needs to be designed to achieve zero deaths and serious injuries in the ROW, not just “improve” safety conditions. Reflect anticipated land use strategies on a 20-year timeframe. Seattle will be denser and greener. We will thrive without prioritizing the use of single occupancy vehicles in the allocation and design of our limited right of way resources. Be context sensitive. Make street improvements be context specific. There is a huge difference in residential, commercial, industrial property, yet many street uses have a one-size-fits-all approach for street trees, curb ramps, sidewalks, driveways, lighting and so on. Demand excellence. Allow SDOT to innovate and encourage pilot projects. Seattle is known as an innovative city. We’ve embraced NACTO, and we’re one of the most highly educated cities in the nation. Our ROWIM should allow us to continually experiment and learn. Make safe streets legal. We want to see new concepts and ideas in this version of the ROWIM. There are a variety of street classifications, safety tools, livable street elements, and intersection treatments that need to be defined and permitted for future use. Collaborate interdepartmentally, with other agencies, and with the public on right-of-way improvements. From a community perspective, public land is public land. We don’t much care if it is managed by Parks, SDOT, SPU, Schools, Libraries, Metro etc. It belongs to all of us. Let’s start making plans and rules for our public spaces collectively. This approach will be needed if we are to build a new connected, citywide grid of low-stress biking and walking routes. Format the ROWIM for easy use.